The Cox sisters of Goldsmith Road were amongst some of the first pupils at Arle (now Kingsmead) School when Mr. Nicholas was headmaster. They recalled a Miss Morgan, Mr. Butler, Mr. Cooper, Mrs. Binns, Miss Warmington, Mr. Burgess and Mr. Howland, to name but a few and talked nostalgically of the lovely school dinners. They also confessed to having a 'crush' on one of the masters. Of the area they lived in, they explored it intensively and recalled a piggery on Hesters Way Lane where the pigs roamed around (probably the one owned by Mr. A. Higgs). They took the little winding paths across the fields being wary of the cattle on Arle Farm and remembered the little cottage at Fiddlers Green where, as Sunday School Pupils, they often had tea and remembered also seeing a plane stuck in a tree. They lived for a time at Seacombe Road Flats and could look across the fields at grazing cattle one of which was very friendly. There was a field of bluebells and at Fiddlers Green Farm there were ponds abounding with frogs and newts (probably the same pond referred to in the Manor Court Rolls). They saw water voles and were sad that this lovely natural habitat has disappeared. Mrs. Gabb bred pekinese, a popular breed of dog at that time and Nadia Cox, who loved animals used to persuade a man who lived in a caravan on Gabb's land, to let her go and stroke the Shire horse which grazed in a field behind the house. You could tell these two ladies had a very great affection for Hesters Way but they sadly deplored the fact that a minority were giving the estate a bad name. One wonders, if in 50 years' time, the residents then will have such fond memories to look back on. Mr. A.D. Baker of Brighton says that in 1923 his family moved from a basement flat in Wellington Square to a council house in Tennyson Road, which remained the family home for the next 40 years. He recalls his pleasure when the King George V recreation ground opened as at that time Brooklyn Road was open country with horses grazing on either side of the path which was known as Joco Browns and led to the village. He recalled Arle House and the muddy roads which led to Christ Church School and Red Roofs School. Just past the recreation field on Brooklyn Road, he says, was the aeroplane field where air displays occurred before 1930 and that all around the field were dog roses, blackberries and in Spring, on Hesters Way, you could gather armfuls of cowslips. He attended St. Paul's College as a student and during the war served in the Home Guard (Dad's Army!) and one of his duties was to stand guard, once a week, at the Electricity Sub-Station on Hesters Way Road during the night. They were issued only with shot-guns and whilst they did not get the chance to 'pot' any Germans, they did manage to 'bag' some rabbits and pigeons to supplement rationing. When it rained, the rain falling on the porcelain insulators made a loud sizzling noise. Well, the dog-roses and cowslips are long gone but the sub-station is still there. Mr. David Gabb is a descendant of the large Gabb family who lived, for a short time, at Fiddlers Green and Hesters Way Farms. He has kindly shared his memories of his ancestors. Frederick and Sarah Gabb, his grandparents, had twelve children some of who were baptised at St. Marks church and at least two of the daughters were married there. Also some of this family attended the Red Roofs School at St. Mark's. Frederick Thomas Gabb was one of these twelve children and after working in the South Wales mines, he took up residence at 'The Rockeries'. He married Irene Elizabeth Overbury, and although they were not blessed with children of their own, they later fostered two boys who worked hard on the farm. According to the neighbours they were not kindly treated. The Rockeries, a wooden bungalow, had been a summerhouse belonging to the Ladies College and had a lovely garden and a very ornamental fishpond stocked with fish. Beneath the house was a cellar where cattle food was kept. This Mr Gabb farmed several acres and was well known in the area as a rather irascible character with a very short temper. This could have been because sometime in the late 1940s he was badly gored by a bull and had to have steel pins in his legs. He was not popular with the neighbours. A principal reason for this animosity originates from the time when myxamatosis was decimating the rabbit population of Arle and Hesters Way. The bunnies on Gabbs land seem to have escaped it and wreaked havoc on neighbouring farms. So incensed were some of the neighbours that someone put poison in Mr Gabbs fishpond killing off his fish. Already short on temper, Mr Gabbs' patience deserted him, when in the 1950s the Council compulsorily purchased the land fronting his bungalow. Mr Gabbs brandished a shotgun at Council employees, the incident being reported in the Gloucestershire Echo. Whatever the situation, it seemed that any correspondence from then on was addressed to his wife and she signed various legal papers. He was for a time a thorn in the side of Cheltenham Borough Council, but later, after selling some land to the electricity authorities, and later still, the remainder to Robert Hitchins, he took farewell of the area by setting fire to his barn and all the carts and tackle therein. He and his wife moved to Church Road, St. Mark's and one of his married sisters lived for some years at The Brooklands in Village Road. Vincent R. Gabb, father of David ran the Gordon Hotel in Lansdown Road for some years, and Mr David Gabb treasures the family papers and letters written by his grandfather to his aunts. I am sure there must be other families of Arle who have treasured documents and photos tucked away, all of which help to make the past more vivid to us. Regarding the name of Hesters Way, Mrs. Hulbert said there was a row of Ash Trees which on being referred to became Ashters Way and eventually Hesters Way. She recalled the Rockeries where Mr. Gabb and his family lived and that it was a long, low bungalow with a verandah along the front and that by the side of the Old Chapel (St. Silas) lived Mr. And Mrs. Higgs next to the Saw Mill. Both buildings were later demolished. During WWI the old Post Office on the corner of Arle and Village Road (Yew Tree Cottage) was run by the Voice family, but later a Miss Allen took the Post Office over and it appears to have moved to a cottage near Tanners Lane. Miss Allen was crippled and used crutches. Next door to Miss Allen's were two little cottages next to Tanners Lane, then two more cottages - Rose Cottage and then a big red house where Mr. Wasley lived. Next to that were Bank Cottages. She remembers many personalities, but especially Nurse Boston, the local District Nurse, who cycled for miles all around the area as far as Staverton and Uckington on her rounds. In the mid 30's a fete was held at Arle House to raise money to buy Nurse Boston a car, and so after that she could be seen proudly driving her Austin Seven. Arthur Betteridge, she recalls, lived along Tanners Lane. He was the father of Mrs. Booth who married Jack Booth. The father of the late Mrs. Webb was Stephen Booth (see Volume One). As a child Mr. Fletcher lived with his family at Hesters Way Farm which was opposite the Rockeries in Hesters Way Lane (Hesters Way Road as it is now) where Mr. Gabb lived. Mr. Gabb Senior had, at one time, also lived at Hesters Way Farm and at Elm Farm. Mr. Fletcher had to walk across the fields to Christ Church School in Malvern Road and, as he says, discipline was very strict and one had to have a very good excuse for being late. The children then, he said, were good mannered and had respect for authority and also knew the 'Country Code'. Of the Farm House, he says, there was a big coal house and wood store and part of it was used for gardening tools. In the house itself, there was a big kitchen which had a boiler to heat the water, but there was also a soft water rain tub which his mother used on wash days. The back kitchen was next to a big living room which had a large cooking range and there were four bedrooms and an attic. Baths had to be taken in a zinc tub as there was no bathroom. The children had to help on the farm and at lambing time they often had to hand-rear the orphaned lambs. In autumn they helped collect fruit which their father sold to the Cider Mill, the proceeds of which helped to pay for the children's clothes and shoes. When Mr. Fletcher was about 11 or 12, in the holidays and on Saturdays he earned a few pence by taking the big heavy cart horse to Prince's Blacksmith in St. George's Place where there is still a vets today. For this he got 2/6d (12�p) which was a fortune in those days. When he started work, he worked for a time at The White House, (now Tungum Hydraulics offices) starting work on the Saturday at 7 a.m. He had to go down the cellar for wood and coal and carry it up. He also had to help out in the garden and feed the chickens and see to the cows. The housemaid, Nancy, who hated her job, had to live in, as did most servants in those days. From 7 a.m. to 8 a.m. Mr. Fletcher cleaned shoes and if he had time, also put fresh water in the kitchen troughs. At 8 a.m. he had breakfast and at 8.30 went to work in the garden. One day Mrs Stevens took him round all the bird baths and told him to scrub them clean or else! But the one thing, which even today intrigues and annoys him, was that on Thursdays he and Nancy had to clean the family silver and were locked in together whilst they did this. Perhaps the owner thought they'd be too worn out with hard work to get up to any mischief! Like the late Mrs. Webb (see Volume 1), he sometimes, as a child, was sent to the Post Office to collect his granny's pension and get a penny (�p) for going. After two years at the White House he went to work at the saw mill on Hesters Way Lane and said the money was good, and he used to be sent to the Pike House Garage for petrol to work the engine. There was a little sweet and cigarette shop attached, run by a tiny lady who was dwarfed by her husband, who was 7 feet tall. Of other Arle residents at that time he recalled the Greenings. Mr. Greening was a gardener and lived near The Cross Hands. He knew Mr. Gabb very well and said he had quite a temper. He used to employ orphaned boys on the land and both Mr. Fletcher and Mrs. Hulbert, who went to school together, said that these boys were not well treated and used to scour the pig bins for food. However, tragedy hit the Gabb family, as Mr. Fletcher recalls, he was told that during threshing time the work was contracted out and when the contractor was moving the threshing machine down Hesters Way Lane it ran away killing one of the Mr. Gabb's brothers. Mr. Fletcher knew the Kearsey family, the Webbs and the Booths, and said that Stephen Booth and Charlie Betteridge used to go to the Cross Hands at dinner time, returning about 3 p.m. somewhat the worse for wear. But it was a close-knit community then. When Mr. Fletcher, like so many others, left to go to War, he served for a time with the Yorks and Lancs Regiment in North Africa, later taking part in the landing at Salerno where he was injured. He was evacuated to Sicily to recuperate and that is where he met his wife to be. He later transferred to the Royal Engineers which he'd always wanted to be a member of. After the war he returned to Cheltenham and Hesters Way Farm, but by then the surveyors were surveying the estate prior to the building of Hesters Way. His parents were re-housed in Tanners Road and Mr. Fletcher and his wife were given a prefab in Alma Road where they lived happily for years before moving to Tanners Road. 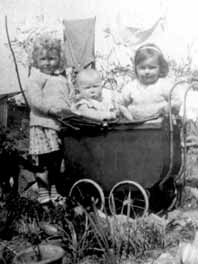 Mrs. Moss and her husband moved to Cheltenham with their two children in January 1951, with the Foreign Office (GCHQ). They moved from Eastcote in Middlesex but the houses intended for the staff were not ready so they were allowed a flat in Bush Court, Priors Road, temporarily. They later moved to Kingsmead Avenue in September 1952 and believes it was one of the first houses completed and occupied in the road. Mrs. Moss remembers the old Arle House which stood back from the road and was told by the locals it was haunted. She also remembered Mr. and Mrs. Street who kept a small riding school next to Arle House. The stables often held cars as well as horses and the owner of Pike House Garage was most helpful if cars needed attention. The children played in Jocker Brown's field (formerly west of Grevil Road) until the houses were built. She is puzzled at the numerous references to Kingsmead, but perhaps this is because there was a rumour that Henry VIII passed through the area. Whether he did or not, one of the fields on Arle Farm was known as Kingsmeadow for many, many years, hence the choice of the new School name. Kingsmeadow was on the extreme NW of Arle Farm, bordering Hayden Road. Chestnut Tree House was occupied by a Dr. Watt and his family and he was always handy in an emergency. She recalls that before Hesters Way Junior School was built children had to walk to Rowanfield through Alstone Lane, which was not, at that time, made up, and so the children wore wellingtons to school and changed into PE pumps on arrival. Her confusion over the siting of the Post Office is understandable as for a time when Mr. And Mrs. Voice ran it, it was on the corner of Arle Road (as it wasthen called) and Village Road. Later, it was run by Miss Allen in a cottage adjacent to Tanners Lane. What a pity there are no photos of the old Post Office with the Webb or Fletcher children collecting their gran's pensions. In the years immediately prior to the commencement of Hesters Way Estate of the families living there, few had claim to fame. Certainly, the Betteridge family appear in Manor Court Rolls in the 18th Century and consistently in the census returns of the 19th Century, but one resident, living in a bungalow near the old Mission Church, could claim affinity with an illustrious ancestor. Mr. Albert Higgs who lived at Hesters Way Cottage was in 1960 age 73 and brother of Mr. Earnest Higgs who lived at 48, Alstone Lane. They were both descended from John Higgs famous for keeping pigs whose epitaph lies in St. Mary's churchyard. The family were noted for their pig breeding and a row of cottages in Alstone Lane were known as Higgs Cottages. Sadly these have been demolished and covered by flats. Albert Higgs was a builder as well as pig breeder and when he lived in Alstone he was approached by a quiet and diffident lady who asked if he would make a coffin for her dog. This he did and became a great friend. After his first wife died, their friendship blossomed. The lady in question was Natalie Owen daughter of a Lt. Col. In the Somerset Light Infantry who went to live in Thornbury on his retirement. The second Mrs. Higgs took Albert to live in her cottage and residents recall that she like the Gabbs, bred pekinese and it seems Albert made more than one coffin, for Mrs. Hulbert (nee Kearsey) recalls that there were several little graves with stones commemorating the pets who had gone to a better place. As a child Natalie's family were great friends of the well-known Dr. W. G. Grace and her father was scorer of the Thornbury Cricket Club where Dr. Grace was treasurer. She kept her father's scorer's wallet for many years. But sadly she is believed to have died about 1953. Their home, like the Mission and so many other places, was demolished when the estate was built. In one of the oldest cottages to survive in Village Road lives Mrs J. L. Roberts, where she has resided for many years. The cottages themselves were, originally, tied cottages for the workers on Arle Farm. They were simple dwellings, two-up and two-down, no bathrooms or mains water in those far off days, but people were not so materialistic then and lived happily enough with what they had. Mrs Roberts recalls going on school outings from Gas Green Sunday School to Bishops Cleeve by train. Yes, there was a station at Bishops Cleeve then. After a pleasurable day there on helter skelters, swings and cart rides, followed by tea, it was time to journey home. They cycled a lot and in those days you could leave your bike and be sure of finding it on your return. Elections gave the children chance to chant for whichever candidate they fancied without the politics of it entering their heads. A less happy memory however was the death of her mother and, as was the custom, she and her brothers and sisters were taken to see her and say goodbye. She recalls seeing her mother with her handkerchief and there was a saucer of salt on her stomach. They were told it was to draw the fluid out of her body. Not surprisingly this memory outweighed other memories of her mother. After this the children were sent to various aunts and uncles. Mrs Roberts was sent care of the train guard to an aunt in Wales. A brother and sister went to another aunt, whilst the two eldest sisters stayed with their father. Two years later he remarried and the family was re-united. They had a wonderful stepmother and two stepbrothers. Later when she married, her husband worked at Arle farm for 28 years until the council compulsorily purchased it. Mrs Roberts also helped with farm work in the mangled grounds and hard work it was too. She recalled the time a carthorse slipped in a boggy pond at the Sitch and it had to be pulled out. The Wood family of Arle Farm also employed Mrs Roberts when they moved to Moat House and Gershom Wood speaks kindly of her. At 86 she is not as sprightly as she was but the cottage, like the others, has been modernised and is bright and comfortable. As for Village Road, it has altered almost beyond recognition.